Kenya – every day's a holiday! 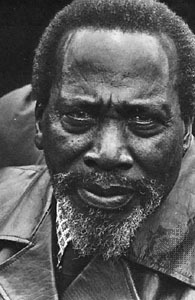 Jomo Kenyatta was a controversial figure, difficult to categorize, impossible to stop. He straddled the world of traditional Kenyan tribalism and European imperialism during the country’s most revolutionary years, and is considered Kenya’s founding father. He found work at the Nairobi Public Works Department, and earned the nickname “Kenytta”, Kikuyu for the type of fancy belt he always wore. Kenyatta took an interest in local politics, joined the Kikuyu Central Association and edited a small newspaper. In 1929, Kenyatta traveled to London to argue for Kenyan land interests. He met with little success, but published an editorial in The Times. Kenyatta studied at the London School and Economics and the Soviet Union’s Moscow State University, briefly joining the Communist Party. Despite his involvement in the Communist Party, later as leader of Kenya, he fought against nationalization of industry and agriculture, encouraging instead European investment in Kenya. In 1952, the violent Mau Mau rebellion broke out against British rule. Kenyatta denied involvement in the Mau Mau attacks, but he was arrested and convicted by a British court in a highly publicized trial and sentenced to 7 years hard labor. When Kenyans won the right to vote in 1960, Kenyatta was elected President while still in detention. He negotiated Kenya’s terms for independence from Britain, and became the independent nation’s first Prime Minister and President in 1963 and 1964, respectively. He died in 1978. Kenyatta is controversial in Kenya even today. He pioneered a one-party political system, and though he greatly increased Kenya’s wealth during his presidential years, much of that wealth went directly to his family and cronies.